Rebuilding roadside walls...good teamwork required! The dry stone walls bordering narrow twisting Lake District roads are regularly hit by vehicles; this accident damaged wall, near Patterdale, is by the A592 just north of Kirkstone Pass. Repairing these walls safely usually involves traffic control; rangers and volunteers from different properties in the Central East Lakes region team up to rebuild walls; stop-go signs are used to keep the traffic to a single file past the work site. The wall was on a difficult section of road to manage as there was a bend as well as a blind summit to contend with; rangers on the stop-go signs were issued with walkie-talkies as an extra safety precaution. ...and a car travelling in the other direction cresting the blind summit. The work is progressing well. A stream of traffic heading south towards the Kirkstone Pass. Thanks to good teamwork the job went without a hitch and with minimal disruption to traffic. Juniper is one of only three conifers native to the British Isles. The other two are Scots Pine and Yew. Juniper was one of the first trees to colonise Cumbria after the ice age glaciers receded. Juniper is well adapted to extreme weather conditions and thrives on the poor soil of the Lake District fells. Sadly only a few scattered stands remain of the dense forests that once covered the area. There are two sub species of Juniperis communis (L). One is prostrate and forms a ground hugging mat, whereas the more common variety is erect and may grow between one and ten metres tall. Charcoal from juniper wood was prized in the manufacturing of gun powder owing to its consistent burn characteristics. Juniper berries are used to flavour gin. The word gin is derived from the Dutch word genever which means juniper. Many juniper stands have trees that are over two hundred years old. The few seedlings they reproduce are heavily grazed by rabbits, sheep and deer. Juniper's poor reproduction is of such concern that the Biodiversity Action Plan includes it as a priority species for Cumbria. Juniper overlooked by the Langdale Pikes. Juniper is a dioecious (two houses) tree species. Male and female flowers grow on separate trees. A reasonable number of male and female trees are needed to ensure successful regeneration. 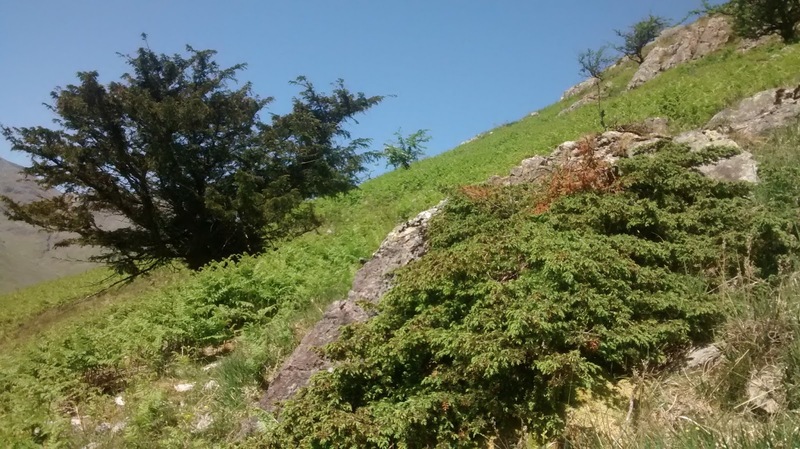 Funding has allowed for the planting of juniper seedlings in various locations in the Lake District including Middle Fell in the Langdale Valley. Bracken easily swamps the young trees so last week a Bracken Bash was organised by the Langdale rangers, based at High Close, before the bracken grew any taller. Rangers based at St. Catherine's, Windermere and Cumbria NT Volunteers joined the Langdale rangers to take on the bracken armed with hazel sticks. The sticks are used to bash the bracken back from around the young trees. The bracken is severely weakened by the bruising and by the bending of its stems. It uses up nutrients in attempting to repair itself and its future growth is much reduced. The Bracken Bash looking towards The Band with Bow Fell and Crinkle Crags in the background. Above the tree plantation on The Band is a juniper stand. The aim is to have juniper stands on Middle Fell once again in the years to come. Rare sight of ground hugging juniper on Middle Fell with another native conifer in the background...Yew. Juniper is an important habitat. It supports over forty types of insects and is host to many fungi and lichens. It's dense prickly foilage provides good cover for nesting birds. The Ring Ouzel, an upland bird of the Thrush family, feeds up on ripe juniper berries prior to its autumn migration to Southern Spain or the Atlas Mountains in N.W Africa. Juniper often grows on rocky outcrops where there is sufficient soil in the crevices and grazing animals find access difficult. the stems contorting into fantastic shapes. Phytophthora austrocedri, a fungus like pathogen first recorded in Britain in 2011, is of major concern. It affects juniper and often causes the death of the host tree. Symptoms are that the foilage turns brown on infected juniper. The pathogen attacks the roots, kills the phloem (inner bark) and lesions form extending up the lower stem. Ultimately the tree will probably die once the main stem is girdled. The images above show juniper with suspected P. austrocedri. Sensible biosecurity measures include keeping to footpaths, keeping dogs on leads and cleaning footwear after leaving sites that may be affected. The increase in global plant trade and changing environmental conditions has seen an ever increasing rise in new pests and diseases to the UK. For instance Chalera die back of ash is threatening millions of ash trees in this country. I am old enough to remember the terrible consequences of Dutch Elm disease and the sadness of seeing the landscape changing almost overnight with the loss of so many magnificent Elm trees. Liam Plummer, newly appointed woodland ranger, is planning to publish a post on this blog site with reference to tree pests and diseases, ways to prevent the spread and ideas on protecting the landscape....watch this space. I'm the woodland ranger for Central and East Lakes working with the other rangers to manage woodlands in Windermere, Troutbeck, Ullswater, Grasmere and Langdale. I've worked for the National Trust for over 13 years across many parts of North West of England including Staffordshire, Cheshire and now Cumbria. My work is very varied and includes looking after ancient trees on busy lakeshore paths to quiet and wildlife rich fell side oak woodlands.